The construction of the NBN is the biggest infrastructure project in Australia’s history with the network being built under intense political and media scrutiny. TelSoc is delighted that the person chiefly responsible for building the NBN, Kathrine Dyer, Chief Network Deployment Officer at NBN Co, will be the Charles Todd Orator for 2018. Post-event: for reference, the following YouTube video was played as a scene-setter to Katherine Dyer's presentation. Kathrine Dyer has been with nbn co for almost eight years, and was appointed to the role of Chief Network Deployment Officer and a senior role in the Executive Committee in July 2017. 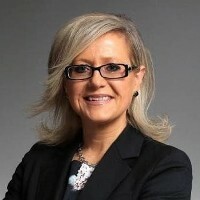 She has been responsible for overseeing the design and build of the nbn broadband access network from both an operational and strategic perspective. Prior to that, Kathrine had a career with Telstra, latterly as National Manager Urban Development Group. She has been at the forefront of fibre optics development and greenfields strategic planning for over 20 years. Kathrine also has an extensive background in telecommunications legislative and regulatory management. She has a Bachelor of Business and IT from RMIT University.